Defined in terms of its cardinal features of hallucinations and delusions, psychosis can be one of the most extreme human experiences. If its treatment in film and TV so often resorts to damaging stereotypes, the relatively new medium of video games arguably has less of a cliché count to wade through, while also offering opportunities to depict the experience with genuine immersive interactivity. Hearing the Voice is an interdisciplinary project on the experience of hearing voices (or auditory hallucination), funded by the Wellcome Trust since 2012. We bring academics (from disciplines as diverse as theology and cognitive neuroscience) together with individuals with lived experience of voice-hearing to tackle questions such as how voices relate to memory, how they can best be managed (in cases when people find them distressing), and how they shed light on typical perceptual processes in the brain. A particular interest is in the experience’s phenomenology, where the humanities offer us methods and conceptual apparatus for making sense of human experience that the cognitive neurosciences largely lack. We were excited, then, to get an opportunity to feed into Hellblade’s design process on the phenomenology of voice-hearing. Our approach is that it is a highly varied phenomenon which is lived with, battled with and often celebrated by people in endlessly divergent ways. Independent game design company Ninja Theory were evidently keen to treat the science properly, but above all they wanted to put the experience first. With support from the Wellcome Trust, they set out to engage people who with experience of psychosis in consultations overseen by the game’s mental health expert Paul Fletcher. Hearing the Voice started talking to Ninja Theory about voices in October 2015. We wanted to make sure that the team were aware of some of the latest research on the extreme diversity of the experience, such as its often uncertain position on the boundary between hearing and thinking, its frequent lack of verbal or even auditory features, and growing insights that it is more akin to an experience of being communicated with than to a frank act of audition. We had constructive conversations about how the game might depict the personified, characterful nature of many heard voices, their overlap with other auditory phenomena such as natural and animal sounds and the murmuring of crowds, and how to represent their strong association with somatic sensations such as feelings of presence, bodily tinglings and burning on the skin. A big part of Hellblade’s portrayal of hearing voices is the use of binaural audio, which can situate sounds around and inside the listener’s head. (Without headphones, you miss a lot of the effect.) We put Ninja Theory in touch with Rachel Waddingham and Voice Collective, the London-based project working with young people who hear voices. Rachel subsequently visited the studio with two young voice-hearers, along with the volunteers Paul Fletcher had been working with from Recovery College East. They literally helped to sculpt the sound design, experimenting with placing the sound sources themselves, listening back and giving feedback, in a process that resulted in an extraordinarily authentic portrayal of voice-hearing. A group of us from Hearing the Voice sat down together to play the game shortly after its release. The gameplay is striking in its emotional intensity, thanks to a meticulous and creative design process and an all-in performance from lead actor Melina Juergens. From the spooky opening scene, Senua’s voices are a constant accompaniment: guiding, chatting, bitching, reminiscing, worrying, encouraging, berating, arguing, bickering. You hear voices sighing and muttering, talking to you from another room, whispering just below the threshold of intelligibility. The fight scenes are graphic, but Senua’s voices are only connected with them in a positive way, shouting warnings and keeping the player safe. Against a horrific mental landscape Senua nevertheless develops an element of control, hearing a malevolent command but not acting on it, in a version of the struggle that is an everyday reality for many people living with voices. Hellblade is an unsurpassed testament to the phenomenological richness of auditory hallucinations, but also to the vast range of communicative and emotional functions they take on. You, the player, learn as Senua does which voices to trust, which will warn her helpfully in a fight and which represent her deepest terrors. Her trials capture the wisdom, central to the international Hearing Voices Movement, that voices represent emotional processes bearing difficult and unpalatable messages from the voice-hearer’s past. Find more about the game at http://www.hellblade.com - and now read reviews from two players. Accurate and respectful representations of mental health are difficult to achieve. No matter how well written, most narratives can only attempt to describe the experience. The interactive nature of a video game, however, can provide a medium in which mental health can not only be described, but experienced to some extent. This is a challenge that Ninja Theory embarked upon with their newest game, Hellblade: Senua’s Sacrifice. In Hellblade, the player takes control of Senua, a young Celtic warrior. Prior to the events of the game, Senua returns home to find that her lover has been brutally murdered in a Viking raid. The game begins as Senua embarks upon an epic quest into the Norse underworld in which she must battle Vikings and outwit the Gods to rescue the soul of her lover. However, not everything is at it seems. It quickly becomes clear that Senua suffers from severe psychosis. The lines between what is real and what exists solely in Senua’s mind are blurred throughout the game. In actuality, Senua’s true quest is to come to terms with both the death of her lover and her own psychosis. Depicting a character with mental health issues is often a risky prospect, as a misrepresentation can be more harmful than helpful. In an effort to avoid this, Ninja Theory consulted with mental health experts, such as Professor Paul Fletcher of the University of Cambridge, and people with lived-experience of psychosis. Senua’s most prominent symptom is her auditory hallucinations. From the opening scene of the game to its closing credits, the player can hear a cacophony of disembodied voices. These voices were recorded using binaural recording, a clever technique which uses two microphones to capture sounds and their positions in 3D space. As a result, the voices whisper close to your ear, or speak from far away, and can appear from all directions. The effect is genuinely unnerving and creates an atmosphere unlike any other game that I have played. Senua has multiple voices, each one an identifiable character with their own emotions and identity, which matches the majority of voice-hearing experiences reported in psychological research (Woods, Jones, Alderson-Day, Callard & Fernyhough, 2015). A group of voices collectively referred to as ‘the Furies’ provide an unceasing commentary on Senua’s actions and the world around her. For instance, they will berate Senua as she edges along a cliff face, pleading with her to go back or insisting that she will fall. They can also be positive, often congratulating Senua when she solves a puzzle or defeats an enemy. Other voices include a soothing narrator who consistently whispers behind your left ear, and a booming voice identified as Senua’s father who bombards Senua with accusations of worthlessness. The voices are your only companions as Senua travels alone through Hel, a beautifully rendered but grisly depiction of the Viking underworld. As Senua journeys through Hel, you must solve challenges left by the Norse Gods. Usually, these come in the form of a puzzle in which Senua encounters a locked door engraved with a glowing rune. In order to open the door, you must find the rune in the surrounding area. For instance, the rune might be seen in a shadow, or an arrangement of trees. Often, Senua will need to be looking at an object from a particular vantage point for the world to align itself into the correct pattern. These puzzles draw from the psychological literature surrounding perception in psychosis. Perception is more complex than what we see, hear or otherwise sense in the world. Our perception is also influenced by what we expect to see. Some evidence suggests that people who are prone to hallucinations tend to place more emphasis on prior expectations in perception (Teufel et al., 2015). This tendency can then develop into perceptions or beliefs that do not have a basis in reality. By asking the player to explore areas in the game world in the hopes of finding a particular pattern, Hellblade subtly requires the player to perceive the game world in a slightly off-tilt manner. This aspect of the game provides a small but elegant glimpse into what an experience of psychosis might be like. Besides the puzzles, the other main aspect of gameplay in Hellblade is the combat. Throughout the game, Senua encounters hulking, murderous Vikings. To take them down, the player must use a combination of correctly timed dodges, blocks and attacks. Initially, a correctly timed block or strike feels very rewarding. However, a very basic combat system paired with a tendency for the battles to drag on longer than necessary makes for a repetitive, even boring experience. Senua’s voices often speak during combat, warning you when a strike is coming from behind or when an enemy is vulnerable to attack. Aside from this, the combat feels like the only aspect of the game which is not informing or influenced by the narrative of Senua’s psychosis. By virtue of their interactivity, video games offer a unique opportunity to explore mental health in an original manner. What emerges from playing Hellblade is not only an intriguing, empathic story, but also a tense and enjoyable game. Ninja Theory should be applauded for paying such close attention to detail in their depiction of psychosis, by collaborating with expert and service users, and for their bravery at tackling a topic which is widely considered taboo in the media. Hopefully it will pave the way for future video games to do the same. Teufel, C., Subramaniam, N., Dobler, V., Perez, J., Finnemann, J., Mehta, P. R., Goodyer, I. M., & Fletcher, P. C. (2015). Shift toward prior knowledge confers a perceptual advantage in early psychosis and psychosis-prone healthy individuals. Proceedings of the National Academy of Sciences, 112(43), 13401-13406. Woods, A., Jones, N., Alderson-Day, B., Callard, F., & Fernyhough, C. (2015). Experiences of hearing voices: analysis of a novel phenomenological survey. The Lancet Psychiatry, 2(4), 323-331. Often, it is difficult to take video games seriously as a medium for telling meaningful stories, particularly when covering psychological suffering and mental illness. If there is ever a video game to take seriously in this regard, it is Hellblade: Senua’s Sacrifice. With Hellblade, Ninja Theory have portrayed psychosis with extraordinary honesty, giving a window into the felt experience of hallucinations – both auditory and visual – and delusions which may cultivate a greater understanding of psychosis for players. Hellblade immerses the player into the story of Senua, a Celtic warrior determined to recover her ill-fated loved one, in doing so battling through the Nordic world of Helheim. 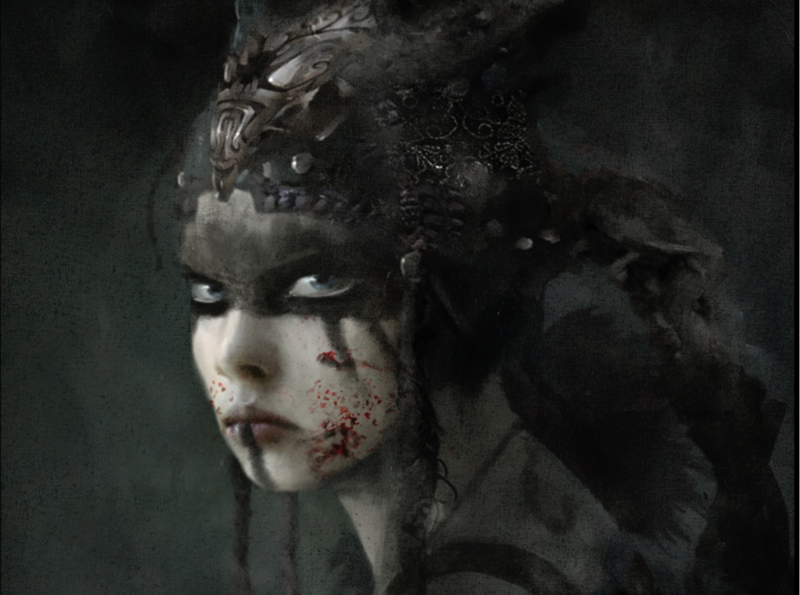 Senua attributes the tragedies in her life to ‘the darkness’, a curse which she fears deeply. Occasional flashbacks give a glimpse of the implications of her psychosis on significant others, including the neglect she received from her community due to her ‘darkness’. Cleverly, the only ways the player experiences Senua’s past is through flashbacks and subtle references from the voices, challenging the player to deduce what is objective reality, and what is Senua’s own reality. Throughout the game, Senua is confronted by Nordic mythos which populate her world and seek to obstruct her path – prompting puzzle-solving and combat. The puzzles are often obscure and play with the visual perception of her world: contorted visuals, vivid symbols floating in the air, and meticulous pattern-finding. Hellblade feels like a very real portrayal of psychosis in a very real period of history; even more so, the immersion fosters an authentic feel to the game. Integral to the immersive realism is the use of binaural 3D audio; prior to playing, I had underestimated how unsettling the intrusive voices would be, particularly as the binaural audio allows the voices to feel close or far away. Indeed, it was an altogether strange relationship of feeling unsettled while the voices chattered away about my failings, but growing to miss them during the quiet segments of gameplay. In cut-scenes, Senua’s character was portrayed with intense emotion which was supplemented by the voices to great effect; the voices varied in accordance with the intensity of the events unfolding with encouragement, delight, fear, anxiety, or the general ridicule of Senua. This helped to foster a connection between the player and Senua throughout the game. It was very interesting how the voices would be both helpful and a hindrance, which made solving a puzzle or defeating enemies feel like winning over your own small crowd. For those of us who are interested in perspective-taking, Ninja Theory has demonstrated the potential of video games to produce a profoundly innovative and immersive experience exploring some of the complexities of psychosis. Hellblade gave an evocative experience of psychosis in the context of a very personal, emotional story, which would be difficult to surpass but easy to recommend. - Reviewed by George Hales, MSc Forensic Psychology student at Birmingham City University.